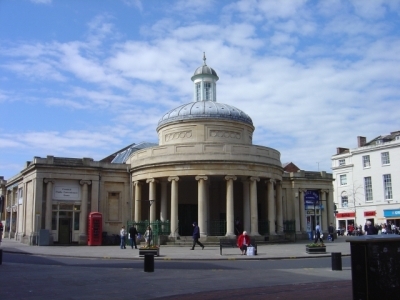 Bridgwater is a small busy town situated between Burnham-on-Sea and Taunton along the M5 route south. Bridgwater has good shopping and leisure facilities and plenty of fine buildings and architecture to admire. Bridgwater used to be an inland port and industrial town during the late middle ages when an international trade in wool, wheat and other agricultural produce helped to make Bridgwater one of the most important towns on this coast and the fifth largest port in Britain. The town has some fine Georgian buildings and is famous for its Bridgwater glass which closed for the last time in 1970. Visitors to the town will notice a bronze statue of Robert Blake and several places named after the town's most famous resident. Born in 1598 in the house which is now Bridgwater Town Museum, Blake was an important officer in Cromwell's army and defended Taunton against the Royalists despite being outnumbered and outgunned. Blake, in recognition of his military genius, was given command of the British navy and won several important battles against the Dutch and Spanish, the most famous of which was the Battle of Santa Cruz.